Practice traditional and modern stone-working techniques, with a variety of activities for any skill level, from beginner to advanced. Make a birdbath, Leaf sculpture, stacked stone or your own kind of creative sculpture. 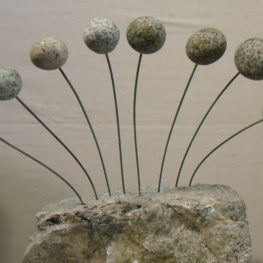 Mini Kinetic Stone Sculpture. Mount natural stones onto metal to create fluid moving art. The project will consist of drilling small holes into natural stones, adding wire to create a small kinetic sculpture. Bring: Feel free to bring any of your favorite stones and or safety gear; otherwise we have everything we need. Wear work clothes and closed-toe shoes.